Professional renovator Tish Amble decided long ago that staying in one place is about as exciting as peeling wallpaper from plaster. So before the paint in each newly transformed home is dry, Tish is researching her next move. This time she chooses a small town in Michigan with a dilapidated Victorian that challenges her imagination. But Tish's idyllic small-town dream fizzles when she finds more in the creepy basement than what was revealed on the seller's disclosure-what looks like traces of foul play. With a hovering police officer living next door and a possible love interest just two doors down, Tish has her hands full. Will she discover the truth before it's too late? 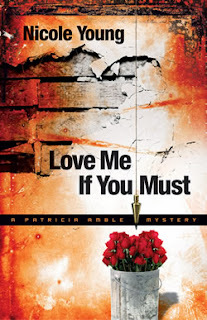 Patricia "Tish" Amble moves into town to renovate a creepy old house. Tish thinks she has found a murdered body in her basement which leads her to believe there is a mystery that needs to be solved. In addition, Tish has a secret past that doesn't want her new neighbors to discover and an interesting new romance with her new next door neighbor. Soon Tish finds herself on a the short suspect list and she sees her past repeating itself all over again. She must solve the mystery to clear her name. Ahhhh. Hmmm. Well this story had potential. It's a clean read. I liked the renovation concept it lacked enough details about that process and what it entails. Ultimately, this book just had too many stumbles. Tish isn't too bright. She's overdramatic and jumpy. She, of course, makes really stupid unsafe decisions. She starts planning a marriage to a guy on their first date and his actions in expressing interest in her are super creepy. The things Tish does just doesn't seem normal. I just couldn't take her seriously. The police/crime procedure described here is laughable. It's not that I think you should be an expert on criminal procedure but I think the basics should be done right and it wasn't even close here. I think if home renovation and crime is going to be front and center here, it needs to be moderately researched. Overall, I might have given this one a better rating than I should have. I'm sorry it wasn't all there with this story! it sounded like it had lots of potential but didn't come all the way together. I hope your next read is more awesome.